It was a long time coming... 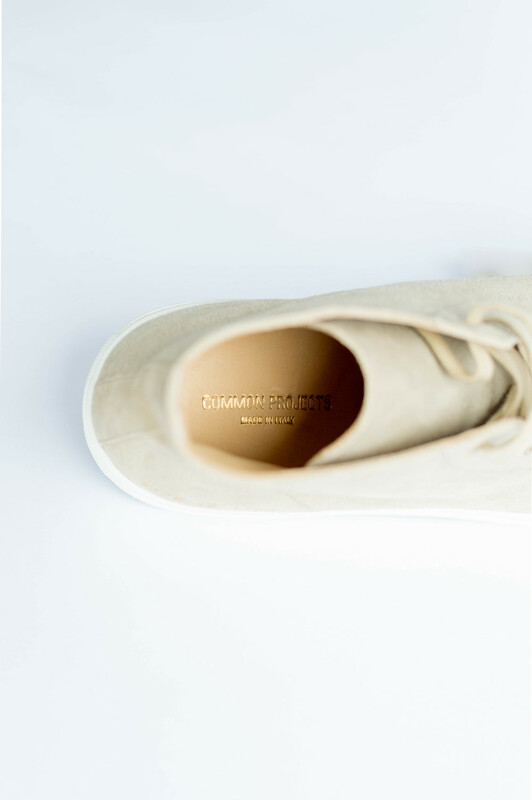 Ever since I laid eyes on the clean, minimal Achilles sneaker from Common Projects, it was hard to look at shoes the same way again. Sparkling white, with little branding to be seen, and perfectly contoured to the natural last of the foot, I simply needed a pair. Seemingly designed with the silhouette of a well-made dress shoe in mind (with its slightly elongated, narrow toe box and low-profile sole), it's no wonder the brand's ever-growing, yet consistent offerings work just as well with a suit as they do with everything from chinos to your favorite swimming trunks. Quickly rivaling Adidas' Stan Smith as the most versatile sneaker ever made, it was only a matter of stomaching what it would cost to get them on my feet; they typically retail for around $400. When I finally worked up the courage to splash on a pair from sale-happy Swedish retailer Tres-Bien, a perfect storm of them not having my size in the Achilles, my newfound infatuation with suede, and Common Projects' newly released fall color-ways resulted in an upset of Goliath proportions; the Common Projects Tournament High - Sand model would be my first pair of CP's. The turn of events quickly proved to be a very satisfying accident. For starters, they're a bit more unique (very few people rock this model, relatively speaking), and they're surprisingly versatile. Thanks to their neutral tone and classic shape, they can be worn with a wide range of colors and styles. The high-quality craftsmanship and materials are evident straight out of the box, and from the first wear it's as though these sneakers were made specifically for you. I'll still get my Achilles someday, but for now I think I'll sit back and enjoy these beauties for a while. Check out the blog links at the bottom of the page to see them in action.